Home › Christianity › Might as well face it we’re addicted to Spam. Spam can take many forms. It can be misleading, sensationalized or inaccurate information, or just disguised commercial advertisements. Some things, like product placements in movies are minor inconveniences, yet other forms help destroy the fabric of trust that society has built over the years. Traditionally people have gotten information from friends, the pulpit, newspapers, radio, and television news outlets. These outlets have served us well, but a nasty truth has emerged. People want spam. In short, spam sells. Journalists used to be a part of an elite group, holding such esteem and influence to be dubbed “the 4th estate” of our society. Top journalists were expected to report well researched facts, and to report these facts from an angle that resonated with most of their audience. Top news anchors such as Connie Chung were fired for taking “cheap shots” or even appearing to be disingenuous. It was a tough line to walk, especially when journalists were the bearers of bad news or hard facts to swallow. As technology improved and information became more readily available, these top news outlets were faced with the ever-more-difficult proposition of keeping their audience’s attention, in a bid to keep their advertising revenue flowing in. Today, viewers have been so desensitized to the sensational, the bloody, the scandalous margins of what goes on in the world, that those stories don’t even draw the kind of audience needed to fund 24/7 news outlets. This stories have become so valuable, that journalists would rather be the first to report the sensational, than be the ones reporting the truth. It’s been said that we’re a “microwave society”. We want fast, easy, and a plentiful supply, but tomorrow, we want something newer and better. We landed a man on the moon and barely did it 6 times before the Apollo program was cancelled due to lack of public interest. There seems to be no waning interest in the ever more raunchy and outlandish “reality tv” shows on cable TV. New, life-changing laws are passed with little attention to details, however, relatively meaningless scandals, faux-pas, and mincing of words get “wall-to-wall” coverage. Hours of news watching and blog and post reading can be spent with little attention to facts and much attention on dramatic conjecture. All of this is the way that it is because of one thing: We’re addicted to spam, and the world is selling what we’re buying. Several social media moguls have recently expressed regret at how their creations have negatively impacted society. Sheryl Sandberg, Chief Operating Officer at Facebook recently went on record as saying that many on her team are saying “Oh my God, what have I done?” We cannot place the full blame on Mark Zuckerberg, Journalists, Google or the News Networks– in a free market society, they’re all just providing a service that we’re demanding, and we’re demanding.. well.. spam. They’re only now realizing that all of this low quality “information” may make money in the short run, but is the cause of a highly mis-informed general public. If we want a democratic society where everyone has their opinion, their say, and their vote– it’s a dangerous game. Many may disagree, but I think our last presidential election was won by a very good manipulator of the system we’ve asked for. Regardless of your opinion of Trump, I think we can all agree that we’d be better served in the future by serving us the truth rather than manipulating our innate desire for the ever more fantastic. In the Biblical story of garden of Eden, Eve was deceived because the serpent made a great line. The serpent said that God knew that if she ate the fruit, she’d instantly know something only God knew at the time: the difference between good and evil. He went ahead and added in a complete lie, “you shall surely not die.” It didn’t matter, Eve had already seen the fruit and loved how it looked. She ate it and gave it to Adam before even noticing the consequence: she allowed evil in, and the world has never been the same. Little has changed since then, except for that our appetites for spam have increased exponentially. The funny thing though is that we should be able to tell the difference between good and evil. We have the tools at our disposal to quit spam. We must demand the truth. We must stop feeding ourselves off of half-truths and entertainment devoid of value. If we want a more healthy mind, we have to feed it a healthy dose of truth and reality. We can no longer rely on anyone to spoon feed us our information without question. Are your senators pro life or pro choice? Look it up! Find several quotes, and use multiple sources. Still not convinced? Write their office! The truth in this instance is that you’re going to have to work. Getting meat off the bone requires work, and your mission is to save the world by refusing to participate in a spam driven economy. It’s not easy, but it’s the only way to save society. The world needs the truth. 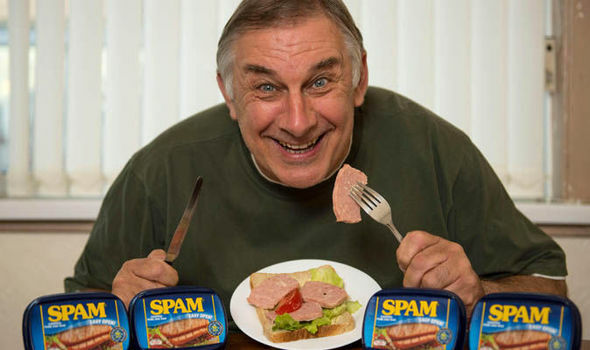 Man cannot live on spam alone.